Arriving to class one day and having a folder of some of the most terrible photos handed to you is something that I never thought would happen when I started this photography course; aren’t we supposed to learn how to take good photos?! Thankfully for Unit 10, we were given the task of taking these blurry, over-exposed, badly framed and boring photos and making something new and interesting out of them. Pretty much straight away I noticed an abundance of red, blue and white (brick walls, clothes, cars, flowers, the sky, ocean) shown prominently in the majority of my photos. Since singling out these colours, I decided that I would cut out these colours and construct them into a Union Jack (even though I am not British) in homage to the country I am currently living and studying in. I also figured that the Union Jack was a relevant nod to my homeland seeing as Australia is also a part of the monarchy/commonwealth and the Union Jack also features on the Australian flag! It is such a well known image with so much weight and history behind it – much of the world was once ruled under this flag. It is a symbol of unity and the joining of nations. 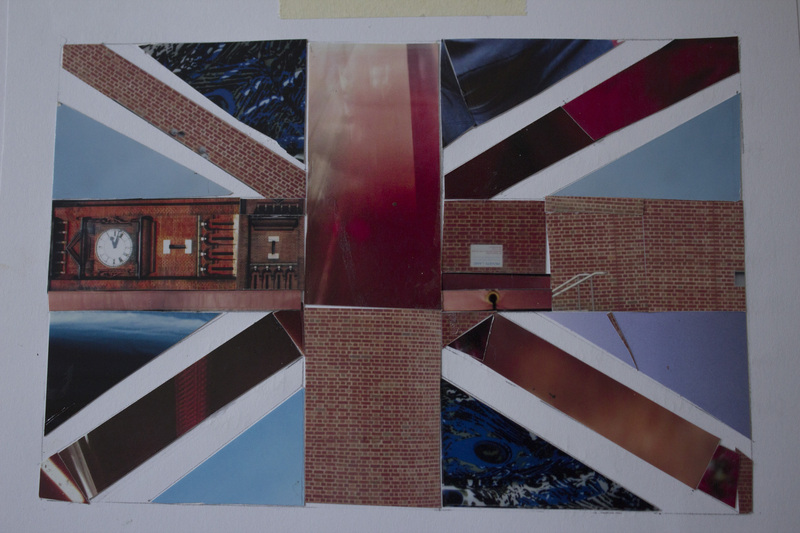 Another reason why I chose to construct a Union Jack was to create a sense of location to where my bad snaps photos where taken. Most of them look like they were shot in parks and streets, which could really be anywhere. So by singling out the colours within the photos to create something distinctly British, I have in a sense determined that these photos were taken in the UK. I originally though of making it quite large (A4 size) but when I started a mock-up (ruling out the lines etc) I decided tat I would need to make it much smaller. I did this because by making it smaller (postcard size) it was like I was creating a post card that I could use to send home to my family with news of my life in London. I think that I have managed to create some quite quirky and beautiful out of pretty much nothing. It is both personal to me and relevant to my current situation; linking in where I am now (London) to where I came from. This idea could have some great potential to be expanded – making postcards of flags from countries I have visited, using bits/colours from photos I have taken whilst travelling in these places!